You can’t pass through Nashville and not visit Grand Ole Opry. It’s just not done. My family was on our #ohmyepicroadtrip this summer and our path led us through this great Tennessee city and I had one stop, and only one stop, that I insisted we make. 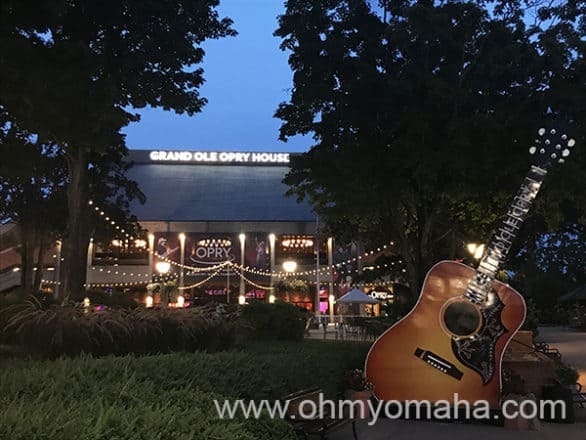 Disclosure: I received complimentary tickets to the Opry so I can write about it. I was not paid to write this post. All thoughts, opinions and typos are my own. The entrance to the Grand Ole Opry is one big photo opp. Bring your camera. We did it. With tired kids who’d been in the car for several hours. We received complementary tickets so I could tell you all about the experience. Everyone is in awe – The Grand Ole Opry is the radio show that made country music famous. If you’re a fan of country music, you kinda have to make a pilgrimage there. But if you’re not, you still get goose bumps there. It has that kind of power. Even performers get a little starstruck by the building. When Aaron Lewis was on stage, he admitted to being overwhelmed by the venue, in spite of having performed to far larger crowds. 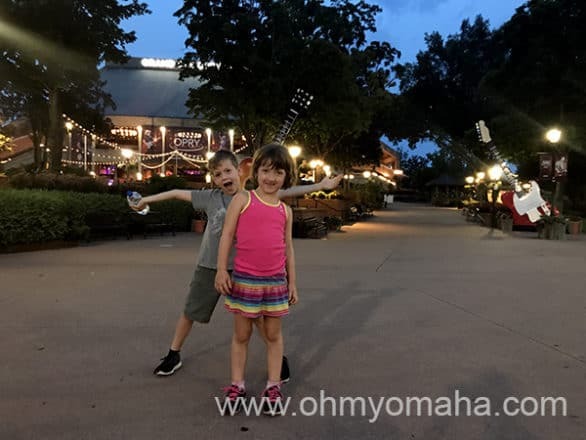 Variety of music – Country has a big umbrella and I wouldn’t lump most of the performers we saw on the night we attended into that broad category. My favorite performer, the lady I was most excited to see when I read the lineup, was the award-winning bluegrass star, Rhonda Vincent. The lineup thoughtfully balanced the variety, scattering hit-makers of today’s country radio among gospel, Western swing and what my father-in-law calls “Country Western,” the performers your parents grew up listening. Each play about three songs and most chatted a bit between songs. It is a live radio show, after all. My favorite performer of the evening was Rhonda Vincent, a Grammy-winning bluegrass singer. Snacks – When going anywhere with kids, this is important. Popcorn and a little heartier fare like pizza and hot dogs are available, as well as beverages (alcoholic and non-alcoholic). The prices, like it is at any concert venue, are more than you’d expect. Celebrities – You never know who’s going to be in the audience or a special guest on the show. On our night, a well-known race car driver was there. 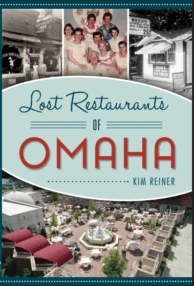 The likes of Kevin Costner, Robert Duvall, Sissy Spacek, Stevie Wonder, and John Fogerty are among the list of famous people appearing there. 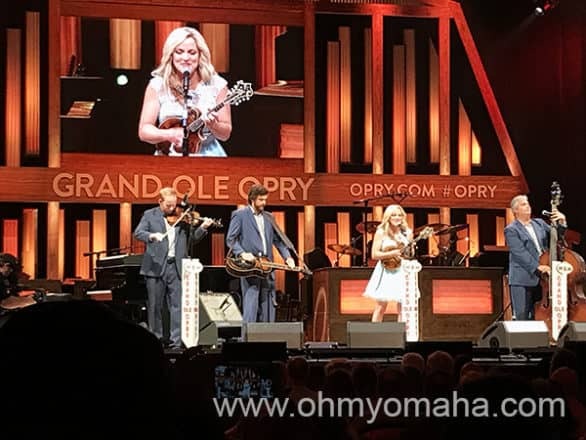 Tours – I’m disappointed that our road trip was off-schedule and meant that we had to miss the afternoon tour of the Opry. This place has a storied history, and you can choose three tours to learn more about it, as well as visit Ryman. FYI, if you want to be on stage when that famed red curtain rises, book the VIP Tour. 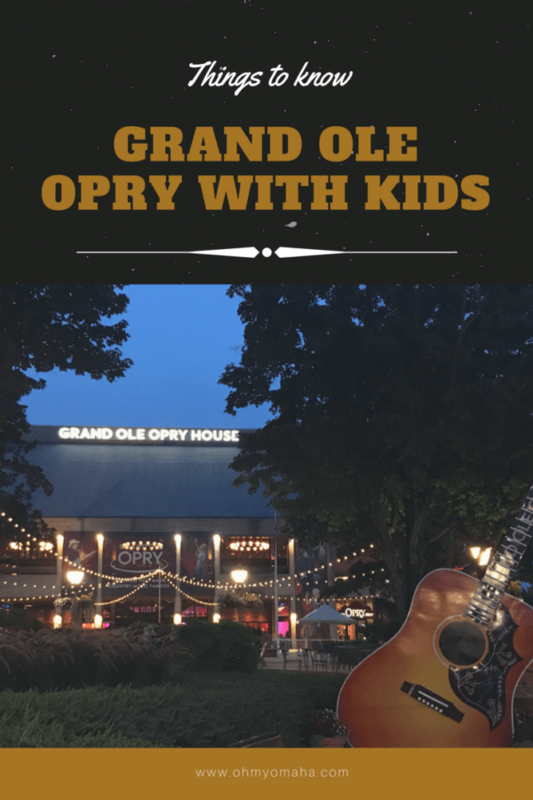 The Grand Ole Opry is family-friendly. I brought two young children to the show and you may be wondering if it’s good for kids. Totally. It is a radio show, so there isn’t much of a chance of hearing anything inappropriate, if that’s a concern. And you can come as you are. Some people dressed up a bit, others wore jeans. It’s an evening show and if you have small children who get tired easily, you may have to weigh the pros and cons of bringing them. Grand Ole Opry shows start at 7 p.m. My youngest was 5 and she started to get antsy and cranky before intermission. Expect the show to last about two hours, including the intermission. On the night we were there, there were four performers in the first half, and four in the second half. FYI: Any child younger than 4 does not need a ticket as long as they can sit on your lap. Where: 2804 Opryland Drive, Nashville, Tenn.
Get travel inspiration delivered to your inbox! 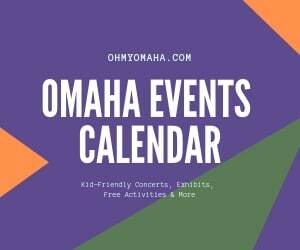 Subscribe to the FREE bi-weekly e-newsletter featuring Omaha, Midwest & more family-friendly destinations! Subscribe here. What a fun experience! I’ve been to Nashville once and of course went to a Grand Ole Opry show while I was there. The night my husband and I went we got to see Joey & Rory, Sarah Darling, Daryl Worley, and the Mountain Band. It was a fun line-up. I will always remember that night and I bet your family will remember yours too. It was memorable! So glad to hear you also had a fun experience there.